Many people suffer from sleepwalking. Sleepwalking, officially known as somnambulism is a behavior in which people walk around and many tasks that they would have done when awake. Sleepwalking is considered as a sleep disorder and can be potentially dangerous. Sleepwalking is more common in children, than in adults. Many children grow out of sleepwalking; however some continue to do it as adults. According to scientists, up to 15% of all children sleepwalk on a regular basis. Sleepwalking usually occurs in the first few hours of sleep, typically during the non–rapid eye movement (NREM) cycle of deep sleep. People usually walk around with their eyes open and they may appear to be awake. It may seem that they are slightly dazed just as most people are when they may wake up from sleep. However, sleepwalkers are not awake, and they will usually not respond when you call out to them or try to interact with them. A sleepwalking episode can last from anywhere between a few seconds to more than 30 minutes. An average sleepwalking episode lasts about 10 minutes, in which the person is at risk of hurting themselves. Most commonly, sleepwalking people just sit up in bed, maybe get out of bed, walk around, open cupboards, get dressed, eat, clean the house, and then go back to bed. However, in some cases the person may walk out the door, get into the car and drive off. There are even extreme cases where people have been known to jump out of a window, walk off a building, climb up a building crane, engaged in sexual behavior with strangers, etc. and all the while being asleep and having no knowledge or memories of the events. Scientists have not been able to identify the cause of sleepwalking, but the main reason for most sleep disorders is when our normal physiological systems are active at inappropriate times. When we are in deep sleep, our bodies are usually paralyzed. 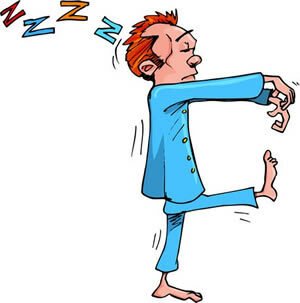 However, in sleepwalking the brain issues commands to the muscles during certain phases of sleep, such to get up, walk, etc. Usually, these commands are suppressed by other neurological mechanisms. However, in the case of sleepwalking, this suppression is not effective. This could be due to genetic or environmental factors, or physical immaturity, etc. In fact, it is now proven that sleepwalking is hereditary, which means that a child is more likely to sleepwalk, if one or both of his parents are or were at some point sleepwalkers. Chances of frequent sleepwalking also increase with sleep-deprivation, fatigue, a chaotic sleep schedule, increased stress and anxiety, having a fever, drinking alcohol, taking drugs such as sedative-hypnotics, antipsychotics, neuroleptics, stimulants, and antihistamines. When sleepwalking does occur it is best not to try to wake the person up, as they may get startled and even scared upon finding themselves anywhere but in bed. The best way to deal with the scenario is to lead them back to bed so that they can go back to sleep. If it seems that they are coming out of the episode, then gently wake them up before letting them go back to sleep. This will prevent another episode from happening in that deep sleep cycle. Also, as a precaution for a regular sleepwalker, all dangerous items should be put away and all doors and windows should be locked before going to bed. There are no cure for sleep walking as of yet, however, many treatments are available that living with it less troublesome and dangerous. The most common technique is to get enough sleep and have a regular and relaxing routine before bedtime. Hypnotherapy has also shown promise in adults. Sleep studies help figure out triggers that can be avoided in the future. Also, in some extreme cases, antidepressants may be used to reduce the frequency of sleepwalking episodes.